There’s so much information available about financial aid for college or career school that it can be hard to tell the facts from fiction. We’ve got you covered! 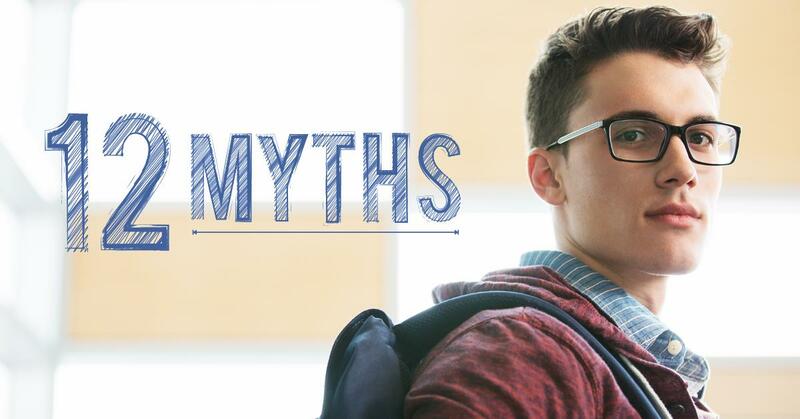 Here are some common myths—and the real scoop—about financial aid and the Free Application for Federal Student Aid (FAFSA®) form. MYTH 1: My parents make too much money, so I won’t qualify for any aid. TIP: When you fill out the FAFSA form, you’re also automatically applying for funds from your state, and possibly from your school as well. In fact, some schools won’t even consider you for any of their scholarships (including academic scholarships) until you’ve submitted a FAFSA form. Don’t make assumptions about what you’ll get—fill out the application and find out! MYTH 2: The 2018–19 FAFSA® form launches on Jan. 1. FACT: The 2018–19 FAFSA form launched on Oct. 1. You should submit a FAFSA form as early as possible because some states and schools have limited funds. MYTH 3: I should use my 2017 tax information to fill out the 2018–19 FAFSA® form. FACT: You must use your 2016 tax information to complete the 2018–19 FAFSA form. (The requirements changed last year.) It doesn’t matter if you or your parents haven’t filed 2017 taxes yet, because the 2018–19 FAFSA form doesn’t need that information. You won’t have to update your FAFSA form after filing 2017 taxes either, because 2016 information is what’s required. If your financial situation has changed since 2016, complete the 2018–19 FAFSA form using the tax information it requires (2016), and then contact your school’s financial aid office to discuss the change in your situation. They can make updates to your FAFSA information if warranted. MYTH 4: I support myself, so I don’t have to include my parent’s info on the FAFSA® form. FACT: This is not necessarily true. Even if you support yourself, live on your own, or file your own taxes, you may still be considered a dependent student for FAFSA purposes. The FAFSA form asks a series of questions to determine your dependency status. If you’re independent, you won’t need to include your parents’ information on your FAFSA form. But if you’re dependent, you must provide your parents’ information. MYTH 5: I should wait until I’m accepted to a college before I fill out the FAFSA® form. FACT: Don’t wait. You can start now! As a matter of fact, you can start as early as your senior year of high school. You must list at least one college to receive your information. You SHOULD list all schools you’re considering even if you haven’t applied or been accepted yet. It doesn’t hurt your application to add more schools; colleges can’t see the other schools you’ve added. In fact, you don’t even have to remove schools if you later decide not to apply or attend. If you don’t end up applying or getting accepted to a school, the school can just disregard your FAFSA form. You can add up to 10 schools at a time. If you’re applying to more than 10 schools, here’s what you should do. If you want to add another school after you submit your FAFSA form, you can log in at fafsa.gov and submit a correction. The schools you list will use your FAFSA information to determine the types and amounts of aid you may receive. MYTH 6: If I didn’t receive enough money for school. I’m just out of luck. FACT: You still have options! If you’ve received federal, state, and college aid but still find yourself having to fill the gap between what your financial aid covers and what you owe your school, check out these 7 options. MYTH 7: I should call “the FAFSA® people” (Federal Student Aid) to find out how much financial aid money I’m getting and when. FACT: No, you’ll have to contact your school. Federal Student Aid does not award or disburse your aid, so we won’t be able to tell you what you’ll get or when you’ll get it. You will have to contact the financial aid office at your school to find out the status of your aid and when you should expect it. Just keep in mind that each school has a different timeline for awarding financial aid. MYTH 8: There’s only one FAFSA® deadline and that’s not until June. FACT: Nope! There are at least three deadlines you need to check: your state, school, and federal deadlines. You can find the state and federal deadlines at fafsa.gov. You’ll need to check your school’s website for their FAFSA deadline. If you’re applying to multiple schools, make sure to check all of their deadlines and apply by the earliest one. Also, if you’re applying to any scholarships that require the FAFSA form, they might have a different deadline as well! Even if your deadlines aren’t for a while, we recommend you fill out the FAFSA form as soon as possible to make sure you don’t miss out on any aid. MYTH 9: I only have to fill out the FAFSA® form once. FACT: You have to fill out the FAFSA form every year you’re in school in order to stay eligible for federal student aid. MYTH 10: I can share an FSA ID with my parent(s). An FSA ID is a username and password that you use to log in to certain U.S. Department of Education (ED) websites. Your FSA ID identifies you as someone who has the right to access your own personal information on ED websites such as fafsa.gov. If you’re a dependent student, your parent will need his or her own FSA ID to sign your FAFSA form electronically. If your parent has more than one child attending college, he or she can use the same FSA ID to sign all applications. You’ll need a unique email address for each FSA ID. Your FSA ID is used to sign legally binding documents electronically. It has the same legal status as a written signature. Don’t give your FSA ID to anyone—not even to someone helping you fill out the FAFSA form. Sharing your FSA ID could put you at risk of identity theft and could cause delays in the FAFSA process! MYTH 11: Only students with good grades get financial aid. FACT: While a high grade point average will help you get into a good school and may help with academic scholarships, most federal student aid programs do not take grades into consideration when you first apply. Keep in mind that if you want to continue receiving aid throughout your college career, you will have to maintain satisfactory academic progress as determined by your school. MYTH 12: It costs money to submit the FAFSA® form. FACT: Absolutely not! You NEVER have to pay to complete the FAFSA form when you go to fafsa.gov. If you’re paying a fee, you’re not on the official government website. Go to fafsa.gov and fill out the application. If you applied for admission to a college or career school and have been accepted, and you listed that school on your FAFSA form, the school will calculate your aid and will send you an electronic or paper financial aid offer telling you how much aid you’re eligible for at the school. Mia Johnson is a Management & Program Analyst at the U.S. Department of Education’s office of Federal Student Aid.